They ran with the wind today. Normally, Wind and Thunderstorms are anathema to me. The one is supremely annoying and the other exceptionally terrifying. 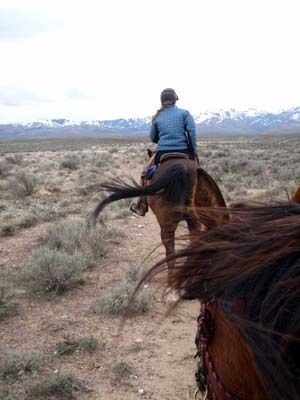 But it had been so long that I'd been on a horse (over a whole week) that I didn't care about The Wind today. 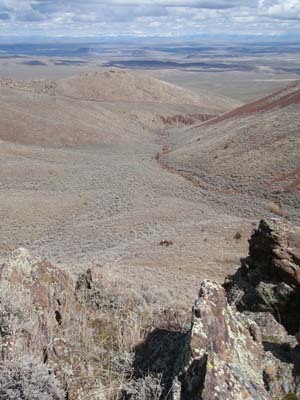 No point in talking because The Wind blew the words out of Owyhee County before they fell on anyone's ears. 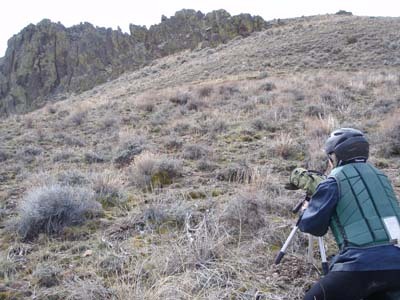 But Jose and I didn't mind the buffeting today on the Owyhee Front. We ride toward the cliffs, hunting for golden eagles. They've nested in this territory the last couple of years. A golden eagle flies off the cliff as we approach, but we don't see from exactly where. 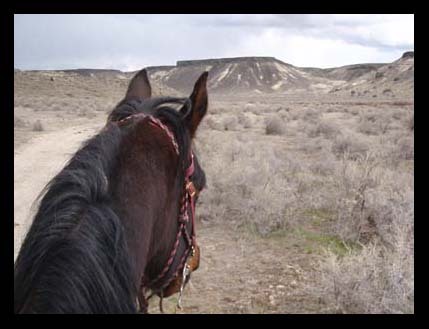 We dismount to glass the cliffs, and the horses are a bit goosey at times, preferring to stand alertly and stare back down the trail whence we came in this narrowing canyon of tall concealing sagebrush - what's back there behind them? What do they feel? What do they smell? Cougars? Wild horses? 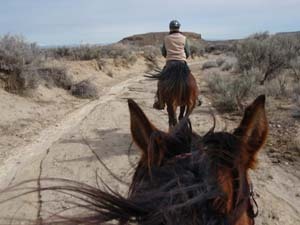 (We did see 4 wild horses in the distance). We spot two cliff nests, and find a likely one that might be, or maybe will be, occupied. We wait and watch the cliff. 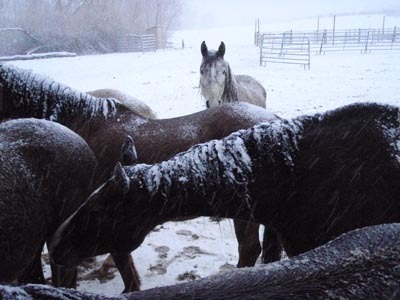 The horses wait and watch down-canyon. No eagle returns. We want to climb higher, for a possibly better look at the nest. How about that ridge above us? 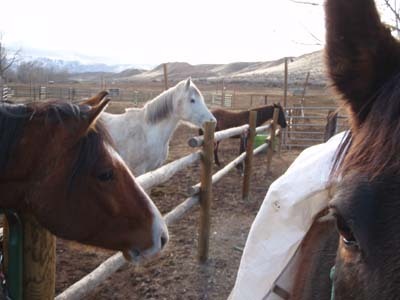 We mount up and point the horses' noses toward the sky. It is a steep climb. Snow has only recently melted up here and the ground is virgin-spring soft. Horses' feet sink above their ankles. It is very steep and deep. But there's no stopping now; we are committed. I am leaning forward over Gil's ears as he clambers awkwardly upwards. He has to stop and catch his breath, but I am afraid we will get stuck with the lost momentum and start to go backwards. I smooch and cluck, "Up!" Gil sinks down deeper as he starts forward. He leaps upward. My feet bang his stifles with every lunge. 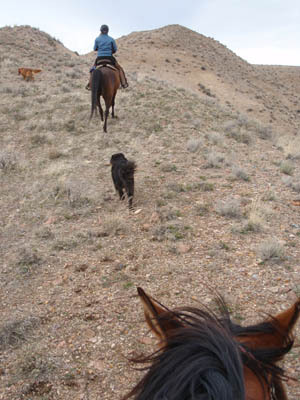 Finally, we crest this ridge, lungs panting, hearts pounding - humans and horse's. "I thought we were going to go over there for a minute!" says Karen. 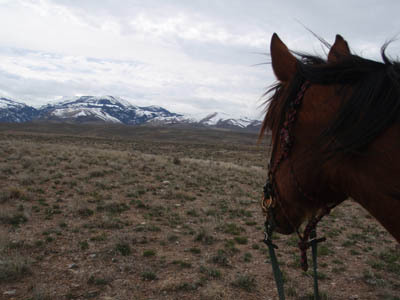 The reward up here is fresh spring grass niblets for the horses, a staggering view over the Snake River valley and the mountains beyond for the humans. Karen sets up the scope, but we still can't see in the nest. I hike on foot, climbing even higher toward the nest - my feet sinking in the ground and the steepness snatching my breath away. The human and horses are dots below me, though I can't see the nest any better from this height. We wait and watch the nest. We see a golden eagle flying, but none returns to the nest. Maybe there already is one sitting low in the nest. Or maybe up here, where snow still dusts the hills not far above us, it's still early for nesting. It's an inconclusive site visit, so it will have to be checked again. Dudley got a present from the AERC convention! It's probably not what he would have picked out had he been allowed to wander the aisles between vendors; however, Steph got it just for him. It's a hay bag slow feeder from Work4feeder.com. Rick designed it (and it's made by him in the USA) all based on how a horse eats and should be eating - more like grazing. 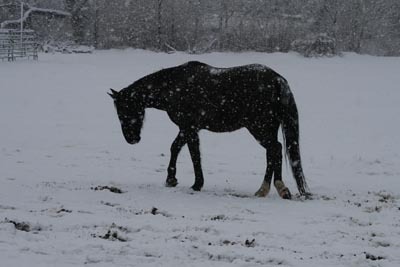 A horse should normally spend around 60% of his day grazing - not bolting a quick meal twice a day like some horses get. And as Rick explained it, when a horse grazes, the bite and rip motion stimulates the saliva that will help digest the food. He's created that type of response and motion in this feeder. It's not easy getting hay from between the rollers... but then that's the point. It stops a horse (Dudley!) 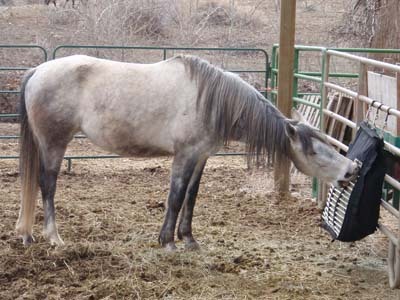 from gorging, allowing the horse to gradually eat his meal. The food is always there, and as he has to work at getting it, it keeps him occupied - time he would otherwise spend trying to find a way to escape from his pen to get more food. It's designed for rough and tough use. 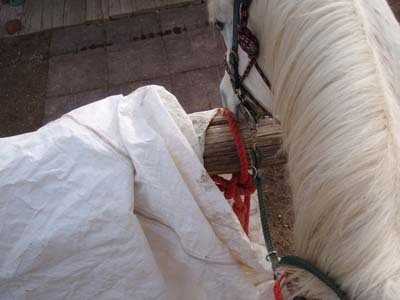 The roller bar grid allows the horse's teeth to work the hay out while not getting caught on anything. 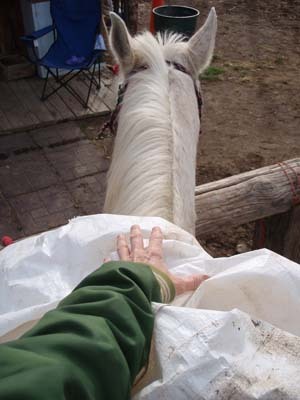 There are flaps on the sides and bottom of the bag that a horse can yank on (that are made not to rip) - as a horse like Dudley will inevitably try to shake hay out more quickly (it won't work). Dudley is usually turned loose with the herd during the day and locked up at night, and when I feed him in the evenings, I toss a small amount of hay on the ground, and fill the hay bag (it can hold 30-60 pounds of hay, but I just stuff it full, lightly packed down) - and 75% of it is gone by morning. Dudley has already lost weight in the 2 weeks since he's been using this feeder... though it also has to do with his diet and DCarb and his return to exercise. The real proof of this slow feeder's effectiveness is in the fact that Dudley hasn't escaped from his pen yet. He's too busy taking his time eating. Check out Rick's website at http://www.work4feeder.com/ for more information. It was indeed a great present from the convention, though Dudley himself probably would have cleaned out the horse feed displays. 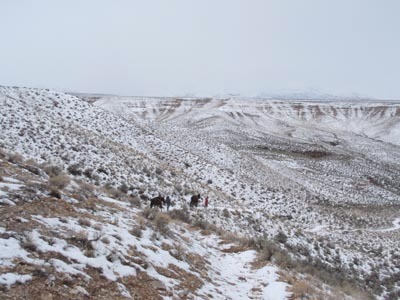 along the Snake around Wild Horse Butte, and over old wagon tracks along the Oregon Trail back to Rye Patch. 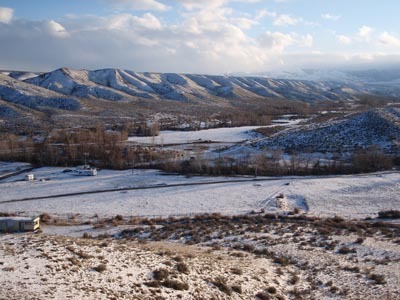 One might want to avert one's eyes from the darkest blue bubble clouds that just might conceal little lightning bolts, and instead focus on the lighter gray clouds, or the white snow showers in the Owyhees, or the slips of blue sky to the east. The only wild horses seen this day are Superhero Batman, and the Old Man Rhett, who, necks arched and legs churning and manes flapping, want to sprint much faster than the 11 mph we are averaging. They leave two riders with cramped hands and sore arms. pinning his ears and making faces at the mare Replika, a bit unnerved at the fact that she is not impressed with his Super Powers. She rolls her eyes at both the boys' antics and she keeps up with them just fine, with no theatrics. 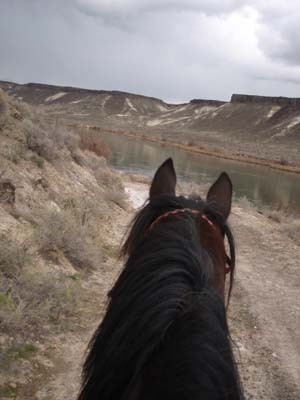 It's a good brisk 15 mile springtime workout for horses and riders. 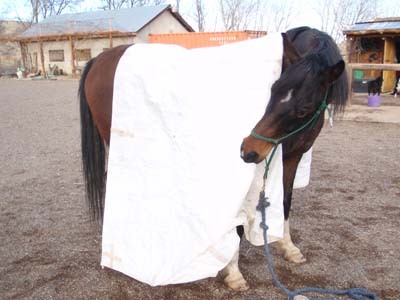 Can your horse handle the sight of a tarp? What if it's flapping in the wind? Will he walk over one? Will he drag one? Can he pick one up? Can you drag one over his head? Why shouldn't he be able to do all of this with a tarp? 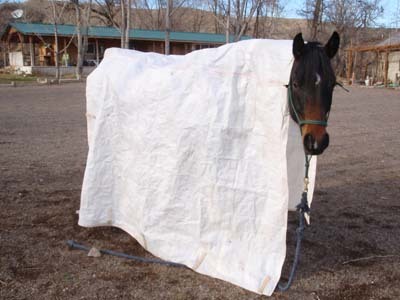 I decided this is the year of the tarp, where all the horses here will get tarp broke. 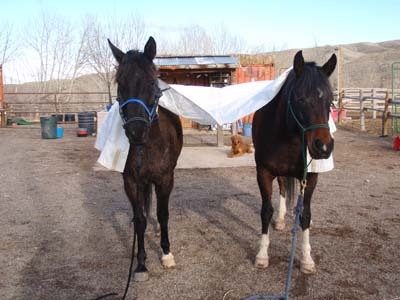 Finneas, and Dudley (who can be afraid of wee little birds), had no problem walking over or dragging around a tarp, or being wrapped by one like twin sausages. Today Mac picked one off the rail, drug it, had it pulled over him from one side to the other. He was eyeballing it, but with only verbal reassurance from me it didn't bother him. 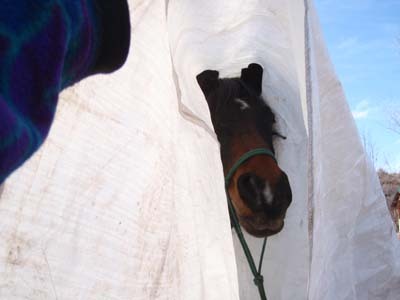 Steph's older horse Rhett wanted nothing to do with a tarp, so his lesson was only to come close enough to put his nose down and snort loudly and sniff it and stand by it. Some horses are so startled by it that I just drag it around with me, pick it up and wad it up, open it up and flap it up and down in the air, far away from them just so they get used to seeing me handle it. 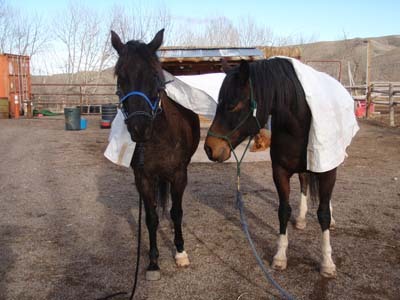 Stormy's friend Tex is very leery of the tarp, but when his friend Stormy walked by him wearing it, he thought that perhaps it isn't that dangerous. The ideas is to not force any of them to do anything that will scare them, but to allow them to conquer the tarp step by step, at their own pace, with little stress. 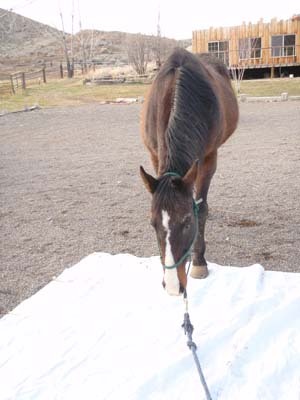 Lest the months of walking, laying the LSD conditioning foundation, may sound boring, it can be far from it if you take advantage of the time to have fun with your horse while you teach him different things. 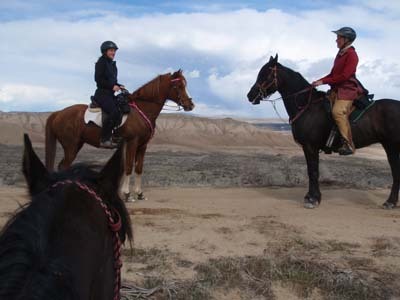 Besides proper conditioning, another big advantage of the LSD training is that your horse is not rushed into speed, which may affect his mental ability to stay calm on the trail. Your horse should remain calm with several initial weeks of walking; as you progress to walking and trotting, your horse should continue to move forward calmly, and in control. If you do come to a spooky situation, it may be best to slow the horse’s pace, so he can evaluate the situation and calmly deal with it, rather than trying to force a horse past a scary object. 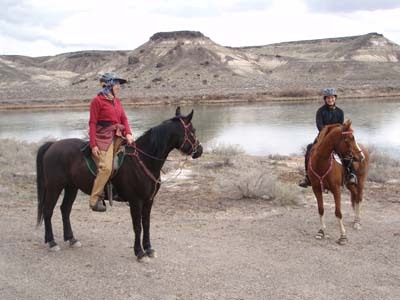 If you know you will be encountering some scary situations on the trail, bring along another friend who has a well-seasoned horse that will not react badly to these situations. 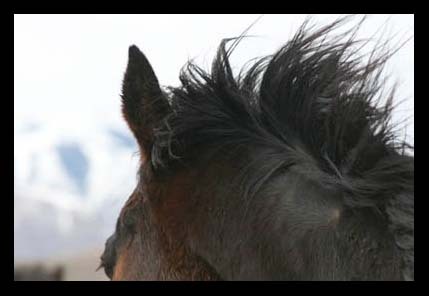 If that horse is calm, your horse will much more likely react the same way – with a non-reaction, which he will carry through to the next time he encounters it. 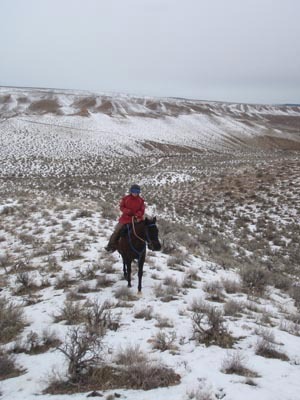 It may very well take the same amount of time to mentally condition your horse, young or old, on the trail as it does to physically condition him. 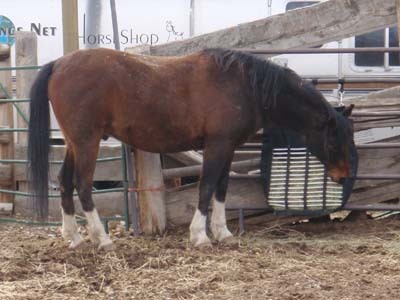 “Re-educating an older horse out of bad habits can take months of patience and firm guidance to reestablish the horse as a partner in anyone’s training discipline,” says Smothermon. Take advantage of the time spent going slow for conditioning to expose your horse to all kinds of situations he may one day encounter on the trail. Go out alone; go in company, and rotate positions: be the leader, be the follower, be in the middle, be on the left side and the right side, and stay relaxed in all situations. Your horse should willingly and easily move off your legs, back up (only when asked! ), respond to your seat and weight, stand still when you get on and off until you ask him to move out. 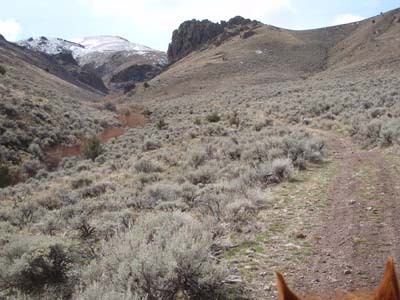 Yes, your horse does get bored with the same trails over and over. Take him on different trails, go different directions. 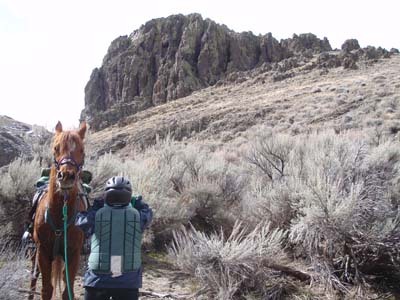 Get him used to hikers, pack horses, bikers, motorbikes, dogs, different groups of horses coming or going. Practice perfecting and hastening your transitions between the start, walk, trot, walk, stop. 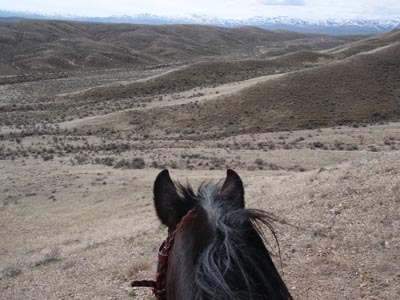 Teach your horse to stay on the trail, and to willingly leave the trail when you ask him. Take him through as many trail obstacles you may encounter: rocks, sand; creeks. Encourage your horse to drink at water spots. Let him graze occasionally along the trail. Teach him to walk back home calmly on a loose rein. 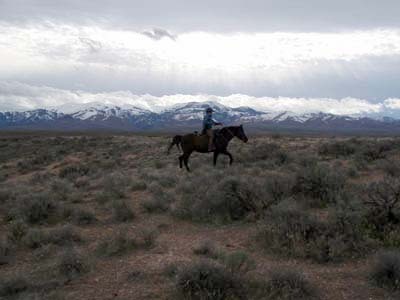 When you get back home, or to your trailer, teach your horse to tie to a trailer, or a tree, in case you will be in a ridecamp or camping out on the trail all night. Teach your horse to accept everything he would encounter at a vet check in competition – touching his mouth, his legs, his rear end muscles, taking his heart rate, listening to his gut sounds. If you have friends whose horses are further along in their conditioning, resist the temptation to just follow along faster than your horse is ready for, just to have company. Ride to your own horse’s training level. When you think of all the things you can do during these months of walking and slow trotting, and you see how obedient and supple your horse is becoming, you will realize there is no limit to what you can teach him. You may find you really enjoy these training strolls with your horse and you don’t want to progress to trail competition. 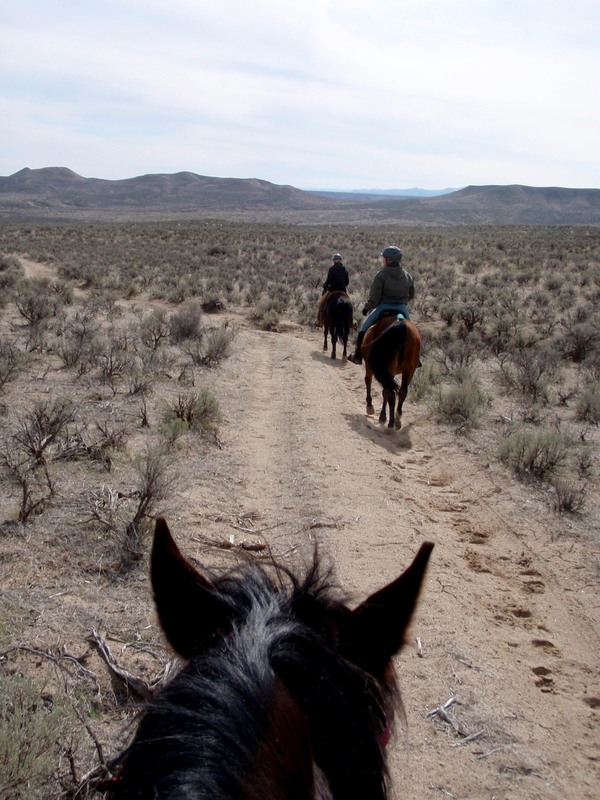 Don’t be in a rush to get your horse fit or competitive on the trail. Remember, slow is fast. The time you may have think you saved rushing your horse’s body systems into shape can come back at you through injury and a much shorter career. 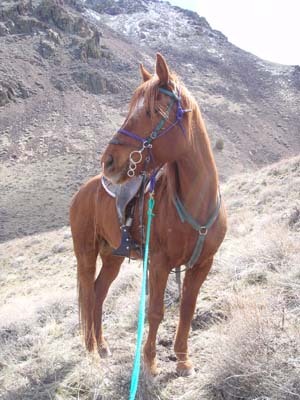 Throughout all of your successful efforts of conditioning and training your horse, be it for Competitive Trail Riding, Endurance, or just Trail Blazing solo or with friends for the day, you will develop a strong horse and a unique partnership and understanding with him that will last for many years. 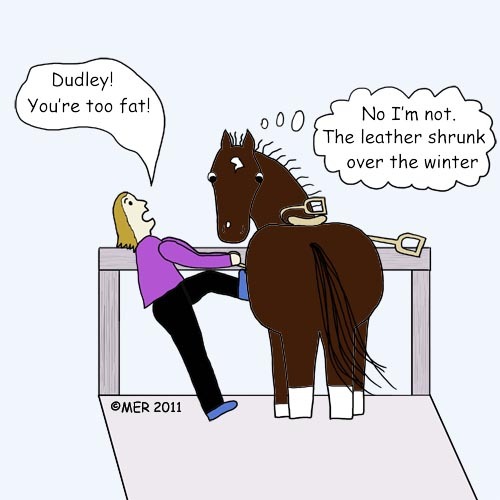 Since it's that time of year for many riders – time to get back in the saddle and get your blubbery horses back into shape, I'll have a few articles and links on conditioning horses. The following is a general training article of mine that was originally printed in Trail Blazer magazine in 2007. You’re one of those riders who doesn't enjoy the confinement of an arena. Your horse doesn’t take well to it either. 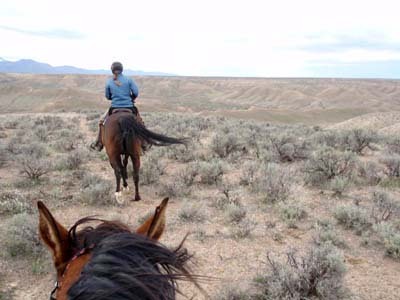 You love the outdoors and can really think of nothing better to do than spend all day in the open spaces with your horse. Maybe you’d like to have the option of adding competition to your riding repertoire. But how do you get there from here? Whether your goal is to participate in competitive trail rides, endurance rides, or just pleasurable trail rides, start with the fundamentals of building a solid foundation of physical conditioning and mental training underneath your horse. 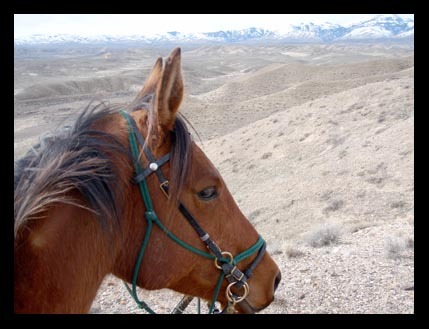 Getting your horse fit and confident to handle any challenge, physical and psychological, is essential to a thriving partnership and success on the trail. Conditioning is subjecting the horse to the stress of exercise, in gradually increasing workloads over time, allowing the horse’s body systems time to adapt to each increase. This process is known as progressive loading. Not only will it maximize the horse’s performance, but will also help keep the horse sound. Increasing workloads means slow and steady increase in either the duration of exercise, or the speed of exercise, but not both at the same time, approximately every week. You have an advantage if you are working with an older horse who has previously had an athletic career. His body has already been accustomed to the conditioning program, so you won’t be starting from scratch, as you would with a youngster or an older horse that has never had any kind of physical training. What type of horse do you need for success? 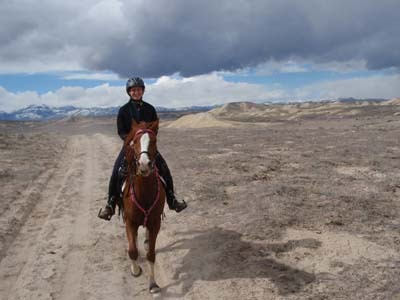 “Any breed of horse and any discipline of riding can compete at the North American Trail Ride Conference Novice level as long as the physical and mental preparations are made to compete at 20 to 25 miles,” says Lynn Smothermon, a recreational/competitive trail trainer in Orange, California. The same applies to limited distance endurance rides and pleasure trail rides - any breed can be successful. While Arabian horses have proven best in general for long distance endurance rides, there are of course exceptions; every horse is an individual, and some may naturally do better than others despite their breeding. Patience is a key to conditioning; it is tempting to start too soon and do too much too fast. 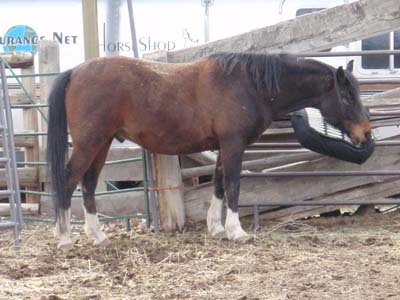 It can take 2 to 3 years to fully condition a horse’s body systems. The cardiovascular system is the first to whip into shape. In approximately 6 months, your horse may stop huffing and puffing so hard after a workout, and he may appear to be in shape. But it’s the other systems that need the most nurturing and that take the longest to come round. According to Dr Nancy Loving, DVM, it can take ligaments and tendons 6 to 12 months to fully develop, and it can take up to 1 to 2 years for the conditioning of bone. 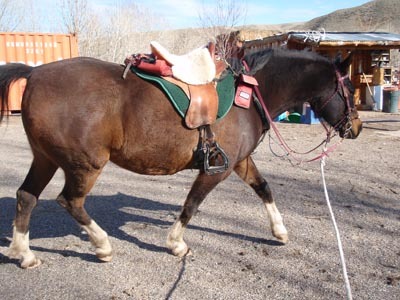 For the older horse, start out with taking him 4-6 miles every other day for about an hour. This will be mostly walking, with very little trotting. After 3-4 weeks, it’s time to add stress by increasing his workload. This means adding a little speed, or a little distance – but never both at one time. Either add more trotting over the same distance, or increase your training time by 15 minutes. 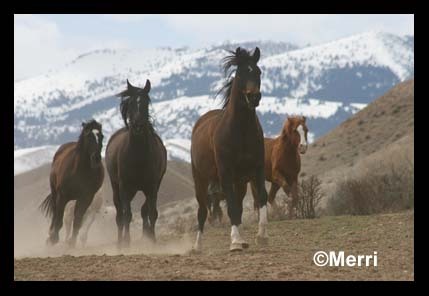 A good rule of thumb for older horses is to increase workload on a 5 to 7 day cycle. Over the weeks and months, you will gradually increase your horse’s workout time up to a few hours, with more time spent trotting and occasionally cantering. This is a good time to begin monitoring your horse’s heart-rate and recovery; it is one of the best ways to determine the progress of his fitness. In well-conditioned horses, the heart rate should be around 60 beats per minute 10 minutes after a reasonably demanding workout. As you work on conditioning your horse, monitor his progress by observing the change in his physical appearance – you should be able to see muscle development and definition in the first month. Monitor his weight by measuring his girth. Watch and feel his legs for any signs of heat or swelling. Observe his attitude: is he enthusiastic and alert during and after his training, or is he dull and tired? Keep a log of your training schedule and progress, and his heart rate and recoveries. Take pictures every week so you can see his physical change over time. 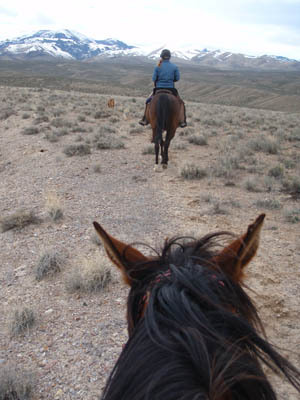 When your horse’s heart rate recovers to 48 beats per minute within ten minutes of completing his exercise, (which can take from several months to a year of training), and your goal is simply pleasure trail riding, you can maintain your horse’s fitness at this level by continuing the same distance or speed of workouts a few times a week. If your goal is competitive trail riding or endurance, now it’s time to add strength training. Add some inclines to your training, or trot your horse through sand. Be very cautious in sand, however, as it’s hard on tendons and ligaments. It’s best to avoid trotting through sand with young horses, and be extremely wary in deep sand with any horse. Now is also a good time to take your horse into the arena once a week as part of his workout regimen. Suppling exercises of circles and figure 8’s, leg yielding and sidepassing will increase your horse’s flexibility and range of motion, and therefore help prevent injuries. If your ultimate goal is long distance endurance riding, you should add some anaerobic training to your conditioning program. Endurance rider Dr Nancy Loving gives good insight on aerobic and anaerobic conditioning in her books Go the Distance and All Systems Go. 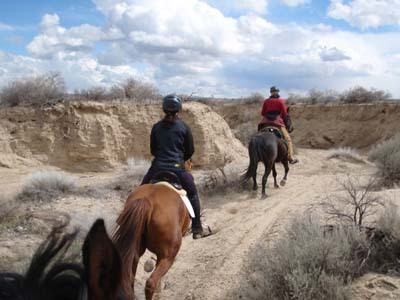 If you are aiming for Trail Riding Competition, your first goal will be the Novice level of 25 miles. Same goes for endurance competition: your first goal should be the shorter limited distance rides of 25 miles. 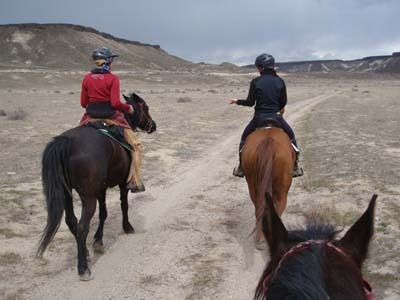 Depending on how your horse comes out of the ride – tiredness, weight loss, heart rate recovery – you may want to do several more limited distance rides – no more than one a month, before you progress to a slow 50-mile endurance ride. 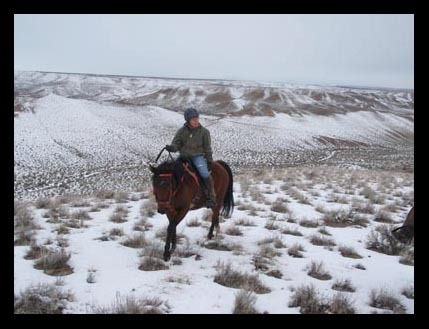 When your horse has done several 50-mile rides and handles it well – perhaps in his second season of endurance – he may be ready for his first multi-day ride, or a longer endurance ride. The same goes for ride competitions as it does for training: slow is better. If you want to have a fast top ten horse, spend 2 years of riding slow (especially if you are riding a young horse, a 5 or 6-year-old in his first years of competition). 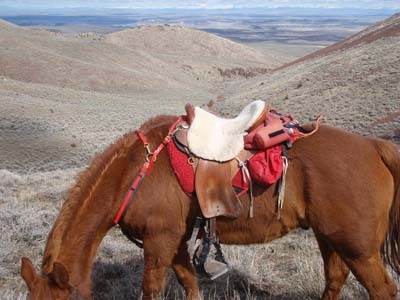 Your horse will stay sounder longer and go many more miles over the years. It's been a lazy winter. Flab is overtly abundant. One particular Horse-Who-Shall-Not-Be-Named (starts with a "D" and has the letters u-d-l-e-y in the name) has love handles and he didn't particularly appreciate me squeezing them. It's time to get down to business. Regina reminded us the Tough Sucker endurance ride is only 5 weeks away. It's practically spring in Owyhee. No more time off - the workouts and re-conditioning has begun. Hills are crying out to be climbed. Sand washes are clamoring to be worked up. No more indulging at gorging hay 24 hours a day (well for Horse-Who-Shall-Not-Be-Named for sure, anyway). We have a lot of horses to get in shape. Ourselves too! Lock your doors. Get those winter coats and boots and hats back out. Turn on your heaters. Fire up the hot tub. Winter's not over yet. Snow follows the Ice Princess to Arizona, to Montana, to Arizona, and back to Idaho. 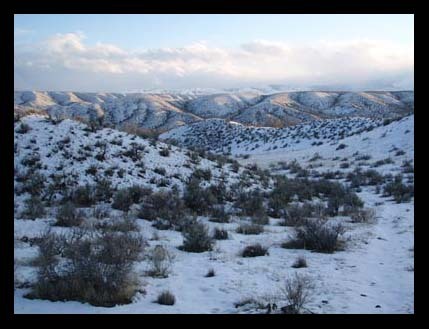 An Owyhee morning comes and a blanket of white covers the ground. 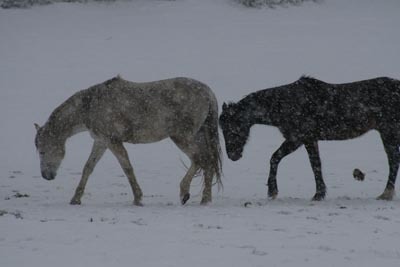 Snow gloms on horse tails and forelocks and backs and manes. Cold wet bodies shiver. 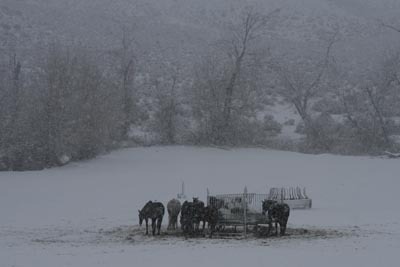 Horses huddle around the feeder, butts to the wind, eating hay for warmth. ...as The Ice Princess dances in the snow.